Mike gave us a great summary of the accomplishments of the Sound West Group, the development and holding group that did the Roxy Theater rebuild, Quincy Square reinvention, Bainbridge Landing, and the new Fishline store. 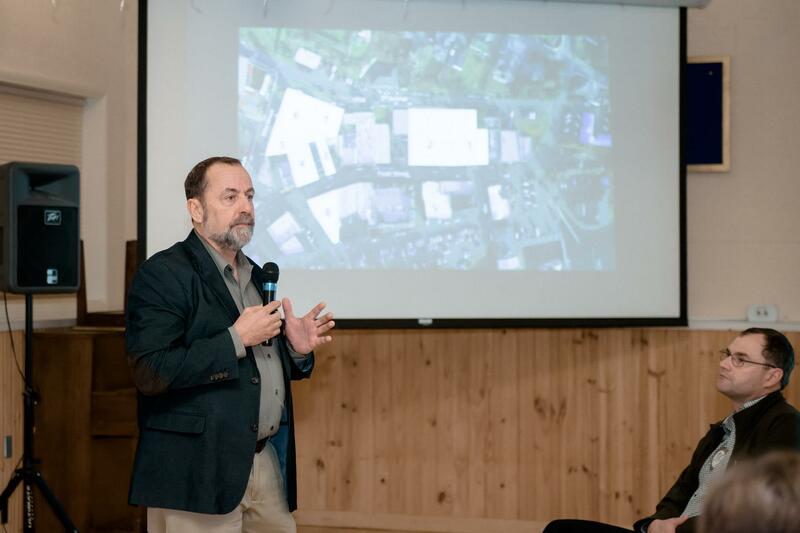 But the true highlight was a presentation on downtown Poulsbo. Marion Sluy sold Sound West Group his aggregate properties, and Sound West plans to retain their unique character and the current tenant mix so that Poulsbo doesn’t lose its village feel and quaint character. The initial focus is on safety of life improvements and deferred maintenance on the buildings along the east side of Front Street. Their plan is to fix up Poulsbo, but they don’t believe it is broken. They want to add parking to downtown while maintaining authenticity in the building architectures. There is a possibility to add up to 122 parking spaces and 40 residential units on the upper floors and behind the Front Street buildings on 3rd Street. They also plan improvements and a unifying theme to lighting, signage, access and pedestrian corridors. Best of luck to Mike Brown and Sound West Group.